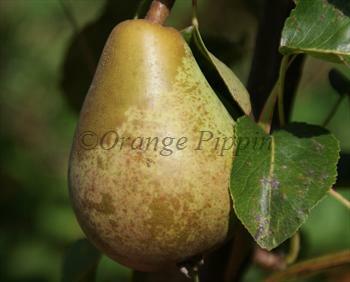 Beth is an excellent early-season pear, very well suited to the UK climate. It grows in a neat and compact fashion (although quite upright like most pears), and cropping is very good in most situations. It has a particularly good flavour, with the characteristic melting texture usually associated with the French pear varieties. In short Beth is the ideal pear for the allotment or back garden. Please fill in the details below and we will let you know when Beth pear trees are back in stock. Beth is in flowering group 3. Beth is self-sterile and needs to be pollinated by another tree of a different variety nearby. 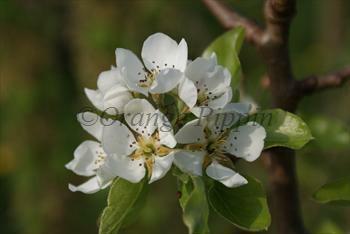 Since it flowers in the middle of the blossom season it can be pollinated by most other pear trees. Beth is one of the easiest pears to grow, and along with Invincible and Conference is a good choice if you have less than perfect conditions. Beth is a low-vigour variety, yet with a heavy cropping potential. This combination can lead to small fruit size, but this is readily addressed by thinning the fruitlets in late May - thinning is a particularly effective technique with Beth. Beth comes into bearing quite young by the standards of most pears, you are likely to get some fruit within 2-3 years. However, be wary of letting it fruit too heavily too early, as this can slow further growth of the tree. The picking season is starts at the end of August in the southern UK, a bit later further north. Keep a close eye on the crop at this stage, and pick the pears whilst they are still hard and ripen in a fruit bowl - they should not be ripened on the tree. 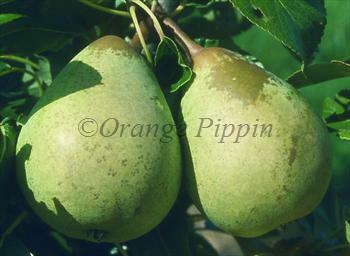 Beth is self-sterile so needs a pollination partner, but will be pollinated by a large number of other pear varieties. Pears are generally more tolerant than apples to wet soils, but much less tolerant of drought conditions. Like all pears, Beth benefits from watering during the spring, as soon as the blossom starts to appear - if there is insufficient rain then apply 4-5 litres of water per day. Beth was developed at the East Malling Research Station in the UK in the 1930s by Henry Tydeman (who also developed many apple varieties including Tydeman's Late Orange). Beth is a cross between Beurre Superfin and Williams' Bon Chretien.